All Stainless steel front, top and interior. (Pictures shown protective white plastic wrap). Back compressor and slim fan coil design to maximize storage space and energy efficiency. Side evaporator uses low speed fan to keep humidity, and to eliminate the need for a drainage connection. 8" Plastic Cutting board. Durable and easy to clean. Unit set on 6" casters for easy cleaning and mobility. 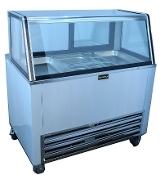 Double duty glass top to keep temperature and save energy. Made in USA. One year manufacturer's warranty on parts and compressor. Buyer responsible for shipping both ways. Be the first to know about our exclusive deals!